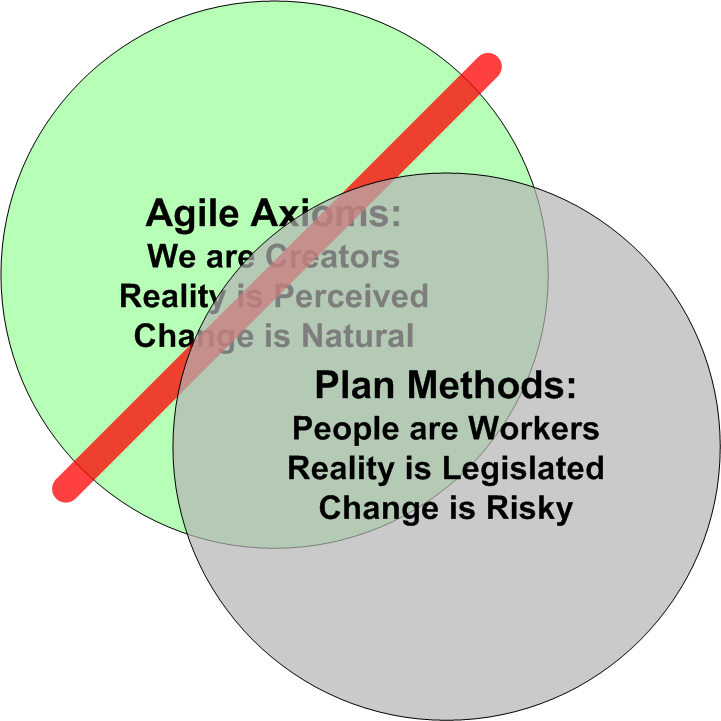 Plan driven methodologies which attempt to mechanize the process of doing work are in opposition to the three Agile Work Principles. A plan methodology attempts to define intermediate and end work products independently of the input and effort of those who perform the work of creating the work products. This disenfranchises people from their work and leads to low morale. It also establishes a heirarchy of value for the people working on an effort where those who create the plans are perceived as more important or valuable than those who execute on the plans. This principle is usually acknowledged, but is usually described as a “problem” to be dealt with rather than as a basic principle to be fully embraced. A plan methodology has “change control” or “change management” and “risk management” and puts the whole notion of change in a negative light. This approach also disenfranchises people because they are constantly placed in opposition to reality. Plans attempt to legislate reality. “Thus and so must the project go” results in a constant struggle between the plan and peoples’ perception of reality. Plans marginalize the importance of perception on the belief that reality can be objectively understood. If reality can be objectively understood, then it can be mechanistically manipulated. Thus results can be pre-determined without regard for the perception of those results. Waste is the result of activities or environmental conditions that prevent a team from reaching its goal. The opposite of waste is something that adds value (more, faster or higher quality) to the desired result. 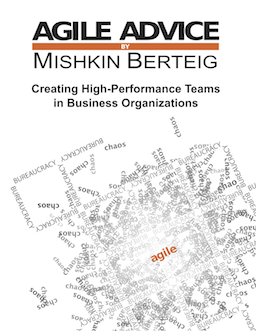 Mishkin Berteig, the founder of Berteig Consulting Inc. and the Agile Advice blog has been listed on the Control Chaos web site as a Certified Scrum Master Practicing. This certification represents acknowledgement of Mishkin’s real-world experience as a Scrum Master. Scrum is a collection of management patterns used to implement agile principles and practices for new product development. An article called Are You Ready for the Agile Future presents a brief discussion about the role of HR in an agile organization. There are several very good ideas. The basic idea is that the HR function must adapt to the nature of agility. This in turn means, for example, hiring people that are agile, nimble, adaptable etc. There are however some mis-steps in the article. Two interesting visual presentations of the progress of adoption of Scrum practices. These are marginally software-specific but could very easily be adapted to non-software agile work situations. This link was seen on a scrum-toronto list, referring to an e-book called Stealth Methodology Adoption. The title is brilliant, and reflects, in my view, a significant means of adoption of Agile technologies at this point in the maturity of this market. What I am trying to do is say that something important really is happening. The value-creation model is moving away from a vertical silo model to an increasingly collaborative horizontal model, from command and control to collaborate and connect, and that’s going to change everything. This comment alone is a fairly close hit at the essense of Agile Work. The rest of the article is very interesting and touches on many topics of interest relating to globalization, business, information technology, outsourcing and politics. There is an interesting article at The Economist also about this book. It is very critical.